Erich Honecker (August 25, 1912 – May 29, 1994) was an East German Communist politician who led the German Democratic Republic (East Germany) from 1971 until 1989. Having joined the Communist Party as a youth, Honecker was arrested and imprisoned during the Third Reich. Following the post-World War II division of Germany, he was elected to Parliament in 1946, and quickly rose to power within the sitting Socialist Ruling Party. Although superficially the standard of living in East Germany under Honeceker resembled his own depiction of the GDR as a socialist paradise, he failed to develop any sustainable economic and industrial infrastructure. Instead, the economy was propped up by loans and payments from West Germany that allowed East Germans to "move to the West." The unification of Germany was not in his political interests, and Honecker opposed this until the end of his rule. Predicting that the wall between East and West Berlin would remain for another hundred years as he resigned in October, 1989, it lasted less than year, as the popular outpouring of support for reunification brought an end to the GDR itself. After German re-unification, Honecker first fled to the Soviet Union, but was extradited by the new Russian government to Germany, where he was imprisoned and tried for high treason and crimes committed during the Cold War (specifically the deaths of 192 Germans who tried to escape the Honecker regime). However, as he was dying of cancer, he was released from prison. He died in exile, in Chile, about a year and a half later. Despite the ubiquitous images of Honecker that had adorned the republic, his rule was never popular, relying instead on the repressive tactics of the Secret Police, the Stasi, to hold onto power. Interestingly, in his speeches and writing, Honecker presented himself as a champion of peace. Honecker was born in Max-Braun-Straße in Neunkirchen, now Saarland, as the son of a politically militant coal miner, Wilhelm (1881-1969), who in 1905, had married Caroline Catharina Weidenhof (1883-1963). There were six children born to the family: Katharina (Käthe; 1906-1925); Wilhelm (Willi; 1907-1944, Hungary); Frieda (1909-1974); Erich; Gertrud (b. 1917; m. Hoppstädter); and Karl-Robert (1923-1947). He joined the Young Communist League of Germany (KJVD), the youth section of the Communist Party of Germany (KPD), in 1926, and joined the KPD itself in 1929. Between 1928 and 1930 he worked as a roofer, but did not finish his apprenticeship. Thereafter he was sent to Moscow to study at the International Lenin School, and for the rest of his life remained a full time politician. He returned to Germany in 1931, and was arrested in 1935, after the Nazis had come to power (Machtübernahme). In 1937, he was sentenced to ten years imprisonment, for Communist activities and remained in captivity until the end of World War II. At the end of the war, Honecker resumed activity in the party under leader Walter Ulbricht, and, in 1946, became one of the first members of the Socialist Unity Party of Germany (Sozialistische Einheitspartei Deutschlands, SED), made up of the old KPD and the Social Democrats of eastern Germany. Following a sweeping victory in the October 1946 elections, he took his place amongst the SED leadership in the short-lived parliament. The German Democratic Republic was proclaimed on October 7, 1949, in the Soviet Occupation Zone with the adoption of a new constitution. In a political system similar to that of the Soviet Union, he was a candidate member for the secretariat of the Central Committee in 1950, and full member in 1958. A 1972 East German postage stamp featuring Leonid Brezhnev and Erich Honecker. In 1961, Honecker was in charge of the construction of the Berlin Wall. In 1971, he initiated a political power struggle that led, with Soviet support, to himself becoming the new leader, replacing Walter Ulbricht as General Secretary of the Socialist Unity Party. In 1976, he also became Chairman of the Council of State (Staatsratsvorsitzender). Under Honecker's rule, the GDR adopted a program of "consumer socialism," which resulted in a marked improvement in living standards—already the highest among the Eastern bloc countries. More attention was placed on the availability of consumer goods, and the construction of new housing was accelerated, with Honecker promising to "settle the housing problem as an issue of social relevance." Yet, despite improved living conditions, internal dissent remained oppressively subdued. A number of East German citizens were killed during this period while trying to cross the border into West Berlin. In foreign relations, Honecker renounced the objective of a unified Germany and adopted the "defensive" position of ideological Abgrenzung (demarcation). He combined loyalty to the USSR with flexibility toward détente, especially in relation to rapprochement with West Germany. In September 1987, he became the first East German head of state to visit West Germany. Despite Soviet leader Mikhail Gorbachev's efforts to liberalize communism in the late 1980s, Honecker refused to implement any substantial political or economic reforms in the GDR, reportedly telling Gorbachev: "We have done our perestroika, we have nothing to restructure." However, as the reform movement spread throughout Central and Eastern Europe, mass demonstrations against the East German government erupted, most prominently the 1989 Monday demonstrations in Leipzig. Faced with civil unrest, Honecker's politburo comrades colluded to replace him. He was forced to resign on October 18, 1989, and was replaced by his protégé, Egon Krenz. 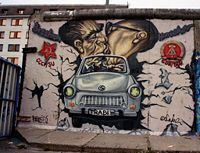 A preserved section of the Berlin Wall at the East Side Gallery featuring Leonid Brezhnev and Erich Honecker riding together in an East German Trabant. Image made in the Spring, 2002 by Peter Rimar. As in many communist countries, the image of the leader was ever-present in public offices, in newspapers, and on television news. The record for most photographs of Erich Honecker in the official SED newspaper, Neues Deutschland, was 41, in the edition of March 16, 1987, on the occasion of Honecker's opening of the Leipzig Trade Fair, as he was shown with different politicians and exhibitors. In addition to German, he spoke fluent Russian. Despite the appearance of democracy, the East German republic was a police state. The Secret Police, the Stasis, were omnipresent. They used hidden cameras and listening devices to spy on the population. Some 300,000 informants helped them to terrorize the population. Anyone expressing dissident views, or anyone disliked by an informer, was subject to torture, imprisonment, and "disappearance." After the GDR was dissolved in October 1990, Honecker remained in a Soviet military hospital near Berlin, before later fleeing with Margot Honecker to Moscow, trying to avoid prosecution over Cold War crimes he was accused of by the unified German government, specifically involving the deaths of 192 East Germans who tried to escape from East Germany. Following the dissolution of the Soviet Union in December 1991, Honecker took refuge in the Chilean embassy in Moscow, but was extradited by the Yeltsin administration to Germany in 1992. However, when the trial formally opened in early 1993, Honecker was released due to ill health and on January 13 of that year, moved to Chile to live with his daughter Sonja, her Chilean husband Leo Yáñez, and their son Roberto. He died in exile of liver cancer in Santiago on May 29, 1994. His body was cremated and the remains are believed to be in the possession of his widow, Margot. Honecker married Edith Baumann (1909-1973) in 1950, and divorced her in 1953. They had a daughter, Erika (b. 1950). In 1953, he married Margot Feist and they remained married until his death (in official publications of the GDR the dates are stated differently, intended to hide the extra-marital birth of their daughter). They had a daughter, Sonja, in 1952. Margot Honecker was the Minister for National Education in East Germany (1963-1989). "Neither an ox nor a donkey is able to stop the progress of socialism." The apparent success of the East German economy under Honecker as a socialist paradise proved a myth following re-unification. The cost to the former West German state in supporting the East has been estimated as 1.5 trillion dollars, and resulted in a slump in the German economy. Honecker presented an image to his nation and to the world as a man of peace, but was guilty of the murder of some 192 East Germans trying to escape to the West. His rule had a veneer of democracy but was propped up by the secret police. His legacy is yet another example of how repression and tyranny can subdue a people and how propaganda can paint a picture that is very different from the reality. Honecker was more or less a symbol of his state but few mourn its demise, nor did it develop any enduring institutions of value to re-united Germany. Terror remains its only enduring legacy. It is ironic that Honecker was imprisoned during the Third Reich and so cannot be accused of having had Nazi sympathies, but once in power, he replicated their tactics. ↑ Chris Burns, CIA files stir up specter of East German secret police. Retrieved August 15, 2007. This page was last modified on 18 August 2017, at 21:03.